The piano lessons his parents made him take when he was young never went over well. But then as a teenager, Karlton started borrowing his sister's guitar, and the fun began. Though he took guitar lessons, the real learning came from picking riffs off his favorite rock albums, and watching other guitarists. He paid his dues by playing in garage bands in high school, and in a succession of cover bands in his late 20's. But, for Karlton, it was never just a hobby. Over the years, his natural musical ability, combined with a willingness to experiment, to listen, and to learn, has developed into an amazing musical talent. He also brings an impressive song writing ability to the band. Karlton is something of a variety act. He's performed solo on his acoustic, played mandolin in duos, and played both acoustic and electric in an assortment of rock, folk, and blues bands. Working with these bands and recording a number of CDs has helped him develop a unique style of playing and singing. He also has a sense of where and how his guitar fills a wide range of roles in a song. 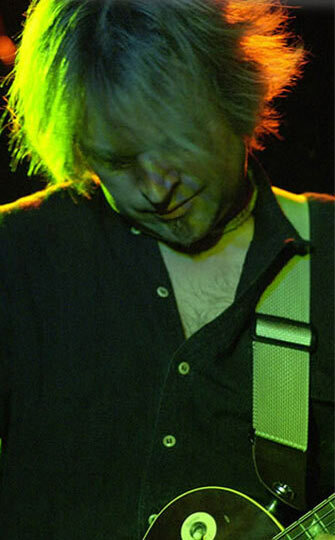 To accomplish this, he sometimes uses unorthodox techniques to produce curious background textures, along with alternate tunings, echoes, wahs, and other FX. His playing has sometimes been described as "sideways" but Karlton tries hard to keep it from going completely upside down.